Some interesting numbers to begin with. According to the recent UK search engine statistics, Google’s market share is 89.1%, after comes the small ones like Bing 6,76%, Yahoo 2.25%, MSN 1.08%, and DuckDuckGo 0.54% in November 2018. Google Maps is one of the most popular Android application today with more than 94% market share. We search with Google everywhere, on our desktop computers, mobile phones and tablets. Because it is so popular, Google has a massive influence on what people see in their search results, that’s why you have to follow the rules that Google dictates. Today, people search differently than in the past, to respond our evolving search habit, Google always improve it’s algorithm, now it has shown strong preference to newer, smaller local companies. When potential customers search for local information, they find your website if it’s well optimised. There are more than 200 factors that Google uses to decide what sites to show when a person searches for something. Local SEO promotes your website’s visibility on location-based searches. It is important, especially if you have a business with a physical store, or one that offers a service in a certain area. In the past, people used to search something with an additional city in the search term, now its mostly disappeared when doing local searches, because people know that the results will automatically be relevant to their location, thanks to their GPS enabled smartphones, Google knows exactly their locations, and gives the search results accordingly. The most common searches we do when we are are looking for something nearby, like furniture stores near me, Italian restaurants around me, emergency plumbers in my area, etc. That’s why important to be ranked at the top in your area for the targeted niche keywords. The results you see on Goolge, aren’t just based on traditional ranking factors. Search results are different for each user depends on the search history, the location, and more factors like demographics, interests, etc. If you’re in London and you search for electricians you’ll get different results than if you were in Manchester and used the same query. Local SEO is the same as the regular search engine optimisation, just with a little bit different approach. As you are targeting a local search, you have to include local modifiers like city names or areas in your content. 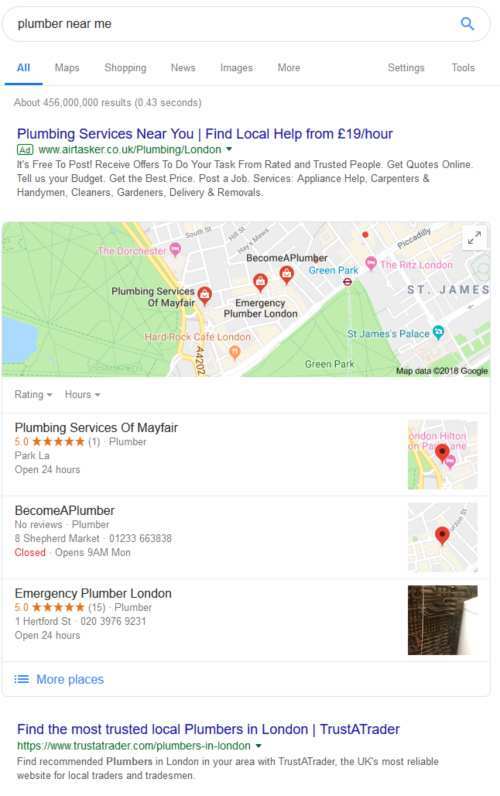 For example if you are a plumber in Chelsea, first you shouldn’t focus on the keyword “plumber” as it’s too broad and very difficult to rank, but maybe to “plumbers in Chelsea” for a more targeted audience. As Goolge knows the user’s location, and the servicing area of your business, you have to optimise your company locally. Every year, hundreds of thousands of new websites are created in the UK alone. Competition is always increasing, so business owners are forced to find smaller target niches and areas in order to achieve relevant visibility. One of the most efficient option to rank higher is to optimize locally. The importance of a local SEO strategy cannot be understated when it comes to mobile search. The latest trend is voice search on mobiles, as more than 50% of users use mobile devices while browsing the internet, its a massive audience. Website content needs to be optimised not only for keywords but sentences too, like “Where is the nearest computer repair shop?” . What Factors Influence Local SEO? If you are looking for an experienced digital marketing agency to do SEO for your local business, you have come to the best place as improving websites is our profession. We offer tested and ethical techniques to move your website rankings to the top. We help contractors and small local companies to be more attractive online. ChelseaSEO can give your business the demanded attention by dominating the search engines. Get a free website audit and let’s get started! Previous What is meant by SEO?